Disinfection Water treatment process can be control microorganism. This Disinfection designed by water treatment plant product water storage tank or online pipe line in water treatment plant. Ozone gas, O3, is a powerful disinfecting agent that can be used in drinking water Treatment applications. Ozone has been used extensively for disinfection and for taste and odor control in Europe, US and Canada. Oxygen in the air (O2) is composed of two oxygen atoms. Under certain conditions, three oxygen atoms can be bound together instead, forming ozone (O). Ozone has many advantages as a disinfectant. It kills all pathogenic organisms by a direct effect on their DNA. Disinfection with ozone occurs 30,000 times faster than with chlorine, so a prolonged contact time is not necessary. And there is no harmful residual left in the system. Ozone, being an unstable gas, must be generated on site and must be distributed into the water immediately to disinfect it. Ozone is produced by passing a discharge of high voltage alternating current through dry air or exposing air or oxygen to a high voltage electric arc. A voltage of between 4000 and 20000 volts is applied to dielectric plates about 6 mm apart or to concentrated tubes, through which the dry air is blown. The concentration of ozone produced by modern plant is of the order of 15 to 20g 1m3 of air. The ozone containing air is then introduced into the water either by an injection system which draws it under reduced pressure or by forcing it under pressure through perforated pipes or ceramic materials immersed in water. The degree of absorption depends upon the depth of immersion of the injection apparatus below the water level in the contact tank and the fineness of the air bubbles introduced, and will vary from 60% to 90%. Ozone treatment is generally effective in dealing with pathogenic bacteria and cysts. Since no residual disinfectant is left in water, the water quality is likely to deteriorate in storage. Advantages of Ozone disinfection are as follows. Complex taste, color and odor problems are effectively reduced. Organic impurities are readily oxidized. Effective disinfection is achieved over wide range of temperature and pH. Bactericidal action is rapid (300 to 3000 times faster than chlorine). only short contact period is required. It reduces chlorine demand and in turn lowers chlorine dosage and so THM formation potential. Disadvantages of Ozone disinfection are as follows. Ozone gas is highly toxic; it does not have the distinct warning smell possessed by chlorine gas and may not cause immediate discomfort when breathed. Careful safety measure is therefore to be adopted with its use. The residual does not last long. High electric input and high capital and operating cost (10 to 15 times higher than chlorine are required). High temperature and humidity may complicate ozone generation. The process is less flexible than those for chlorine in adjusting for flow rate and water quality variation. Ultraviolet or UV Disinfection water treatment systems expose supply water to intense UV light, which kill pathogenic bacteria and may remove some pathogenic cysts. UV rays are found in sunlight, but UV rays can be artificially produced, by passing electric current through mercury vapour lamp enclosed in quartz bulb. The heart of the UV water treatment systems is high-performance spectrotherm lamps (low pressure technology) which provide a stable UV output through a wider temperature range. This special spectro thermal lamps show higher degrees of effectiveness and stability than other conventional lamps. They also exhibit a high UV power output (up to three times more than competitive low pressure lamps) and long operating live (12,000 h), resulting in decreased overall costs. The efficient lamps have a high UV emission in the area of the effective wavelengths (254 nm), that makes it possible to destroy more than 99.99% of all pathogens in water. To further increase efficiency, reliability and service lifetime, electronic power supplies (ballasts) for the lamps were developed. The UV water treatment, like ozone or mechanical filtering leaves no residual component in the water to insure its continued disinfection. Advantages of UV irradiation as a disinfectant are as follows. No chemical is introduced into the water, so the water quality is not significantly affected. Taste or odors are neither produced nor removed. Over exposure does not produce any detrimental effect. Disadvantages of UV irradiation are as follows. 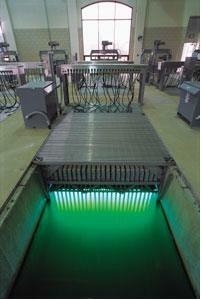 Complete turbidity removal is required prior to UV irradiation. There is no residual; therefore, a secondary disinfectant is needed. Expensive equipment and large amounts of electrical energy are required. Frequent, expensive maintenance of apparatus is necessary. For emergency purposes iodine may be used for water treatment methods of drinking water. Much work at present is being done to test the effect of iodine in destroying viruses, which are now considered among the pathogens most resistant to water treatment. Tests show that 20 minutes exposure to 8.0 mg/ L of iodine is adequate to render the water safe. As usual, the dose required varies inversely with contact time. Lower doses require longer contact time, while higher residuals require shorter contact time. While such test results are encouraging, they are not enough to assess the physiological effects of iodine in treated water on the human system. For this reason its use must be considered only on an emergency basis. Silver in various forms has been used to inhibit the growth of microorganisms. It is most frequently found combined with activated carbon in filters. When some bacteria species come into contact with this silver, they are rendered inactive. There is disagreement among the experts as to the effectiveness of this process because silver ions in water kill E.coli very well and probably also salmonella, shigella, and vibro bacteria, but it has found lesser effect on viruses, cysts, and other bacteria species. Silver does not produce offensive tastes or odors when used in water treatment. Further, organic matter does not interfere with its effectiveness as is the case with free chlorine. Its high cost, interferences by chlorides and sulfides, need for long periods of exposure, and incomplete bactericidal action have hindered its widespread acceptance. Copper ions and copper sulfate are used quite frequently to destroy algae in surface waters such as lakes and reservoirs. But these ions are relatively ineffective in killing bacteria. Copper-silver ionization is brought about by electrolysis. An electric current is created through copper-silver, causing positively charged copper and silver ions to form. When copper-silver ionization is applied, positively charged copper (Cu+ and Cu2+) and silver (Ag+) ions are formed. The electrodes are placed close together. The water that is disinfected flows past the electrodes. An electric current is created, causing the outer atoms of the electrodes to lose an electron and become positively charged. The larger part of the ions flows away through the water, before reaching the opposite electrode. Generally the amount of silver ions at a copper ion rate of 0.15 to 0.40 ppm lies between 5 and 50 ppb. Because of copper-silver ionization, drinking water could be produced safely in space without the use of chlorine. Electrically charged copper ions (Cu2+) in the water search for particles of opposite polarity, such as bacteria, viruses and fungi. Positively charged copper ions form electrostatic compounds with negatively charged cell walls of microorganisms. These compounds disturb cell wall permeability and cause nutrient uptake to fail. Copper ions penetrate the cell wall and as a result they will create an entrance for silver ions (Ag+). These penetrate the core of the microorganism. Silver ions bond to various parts of the cell, such as the DNA and RNA, celular proteins and respiratory enzymes, causing all life support systems in the cell to be immobilized. As a result, there is no more celular growth or cell division, causing bacteria to no longer multiply and eventually die out. The ions remain active until they are absorbed by a microorganism. In the United States, several drinking water production companies use copper-silver ionization as an alternative for chlorine disinfection and to prevent the formation of disinfection byproducts. The standard for trihalomethanes was decreased by EP A from 100 to 80 mg/L. When copper-silver ionization is combined with chlorine disinfection, it is an excellent disinfection mechanism to deactivate viruses and bacteria. what is the fulform of UViFLO. One of the Online water flow of Ultra Violet Sterilizer. Anna Indeed rain may contain chicemals like mercury, pesticides, and nitrates but in the case of flooding rainwater will move large amounts of organic debris. These may contain anything that is lying on the surface of the land including dirt, feces, and bacteria. Therefore a well can become contaminated in potentially harmful ways. After a flood a well water test can be used to determine if the well is safe to drink or if it requires some type of .